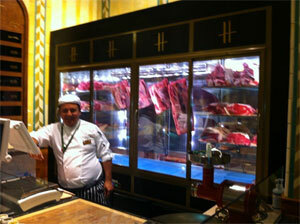 For meat and seafood-loving diners looking for something a little different, we can recommend The Steakhouse at Harrods. Located in a quiet corner in the Ground Floor Food Hall, the chef at The Steakhouse will cook each customer’s steak to order. The steaks are served with vine-roasted cherry tomatoes as an accompaniment. Should the customer be tempted, The Steakhouse can serve a glass of wine, served at the optimum temperature from the By The Glass® Wine Dispenser. 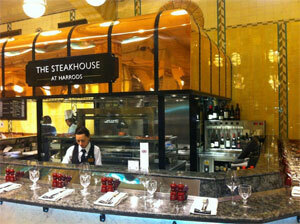 To optimise available space at The Steakhouse, a 6 bottle wine dispenser with portion control is used. 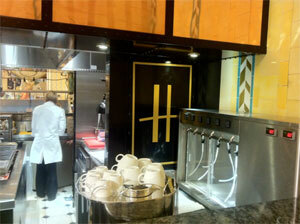 To match the decor of The Steakhouse, the wine dispenser in finished in stainless steel. Wines are available in 250ml glasses or by the bottle, and include Red, White and Rosé. Alternatively, for that special occasion, Champagne is available. Beer and soft drinks are also sold at The Steakhouse. We particularly like the way diners are able to sit at The Steakhouse bar on high stools and watch their food being freshly butchered and cooked to order. In addition to the 21-day dry aged Aberdeen Angus steaks, lovers of seafood have the choice of whole or half lobsters, which can be added to their steak to make the classic ‘Surf ‘n’ Turf’. With a choice of side dishes, sauces and a dessert, The Steakhouse caters for customers who want a quality eating experience without the formality of eating at a restaurant. Steaks are chosen from an array of quality fresh meats purchased from the in-store butcher who is located next to The Steakhouse. Steaks available include premium cuts of fillet, T-bone, bone-in sirloin and bone-in ribeye. While it may be considered sacrilege by meat-eating purists, the in-store butcher can hand mince any chosen steak to make a burger. There are a selection of desserts to finish this meat-eaters feast. If shopping is the main aim of a visit to Harrods and time is short, The Steakhouse provides the perfect lunch-time option for meat lovers who are looking for something out of the ordinary, while staying true to their carnivorous desires.